The Brewers knocked it out of the park last offseason, trading for 2018 NL MVP Christian Yelich, signing star center fielder Lorenzo Cain, and making several under-the-radar pitching acquisitions, including starter Wade Miley. After falling one game short of a World Series berth, the team had a much quieter offseason in 2019. Their biggest addition was catcher Yasmani Grandal, who signed a 1 year/$18.25 million deal with the team despite receiving several multi-year offers from other teams. While he posted a fantastic regular season for the Dodgers, he slumped badly in the postseason. Facing his future team in Game 1 of the NLCS, he became the first catcher in postseason history to allow two passed balls and two errors in the same game, and he eventually found himself riding the bench. The Brewers certainly hope he can put his poor October in the past and once again post top-flight catcher numbers. Regardless, he should be an upgrade over last year’s catcher tandem of Manny Pina and Erik Kratz. The Brewers also notably non-tendered Jonathan Schoop. Acquired from the Orioles at the trade deadline for Jonathan Villar and two prospects, he was expected to provide a stabilizing presence in the middle infield. Instead, he posted a disappointing .202/.246/.331 batting line in 46 games for the Brewers and never seemed to really fit in. To replace Schoop at second base, the Brewers are turning to fellow trade deadline acquisition Mike Moustakas. Moustakas, who re-signed with the Brewers on a 1-year contract, has never played an inning at second base in his career, but the team believes he can make the switch and provide adequate defense at the position next season. If the Moustakas at second base experiment fails, the team has a plethora of options, including moving Travis Shaw back to the keystone (where he spent time after the team acquired Moustakas last season) or plugging top prospect Keston Hiura into the infield. The Brewers also signed utility man Cory Spangenberg to a major league pact, who will provide depth at second base and elsewhere around the diamond. In the outfield, the Brewers traded away two intriguing young talents whose path was blocked in the majors – Domingo Santana and Keon Broxton. Santana was sent to the Mariners for Ben Gamel, who the team believes is a better fit as their fourth outfielder, as well as pitching prospect Noah Zavalos. Broxton, meanwhile, was sent to the New York Mets for pitcher Bobby Wahl and two prospects. The team is very high on Wahl’s potential as a reliever; however, they will have to wait until the 2020 season after Wahl was forced to undergo Tommy John surgery. Beyond Wahl, the Brewers made two other moves to augment the bullpen this offseason, trading for Alex Claudio and signing Jake Petricka. Claudio, who the team acquired from the Rangers, gives the Brewers another left-handed option behind 2018 breakout star Josh Hader. Petricka is coming off of a down year with the Toronto Blue Jays, posting a 4.53 ERA and 1.64 WHIP in 41 games, and the team certainly hopes he can rebound to his 2014-2015 peak when he was one of the best relievers on the White Sox. In the rotation, the Brewers took a couple hits after losing Wade Miley and Gio Gonzalez. Gonzalez, who was acquired at the now-extinct August trade deadline from the Nationals, was great down the stretch for the team, posting a 2.13 ERA in 5 September starts. While he is still a free agent as spring training winds down, there has been little indication that the Brewers are seriously interested in a reunion. Miley, meanwhile, will not be a Brewer in 2019 after signing a 1 year/$4.5 million deal with the Astros. His presence will certainly be missed in the rotation, as he had a fantastic comeback season in 2018 following two subpar seasons. While these losses are less than ideal, the Brewers have a lot of candidates to step into the rotation. There is a lot to be excited about for Milwaukee Brewers fans. Falling just one game short of the World Series last season, expectations are sky high. 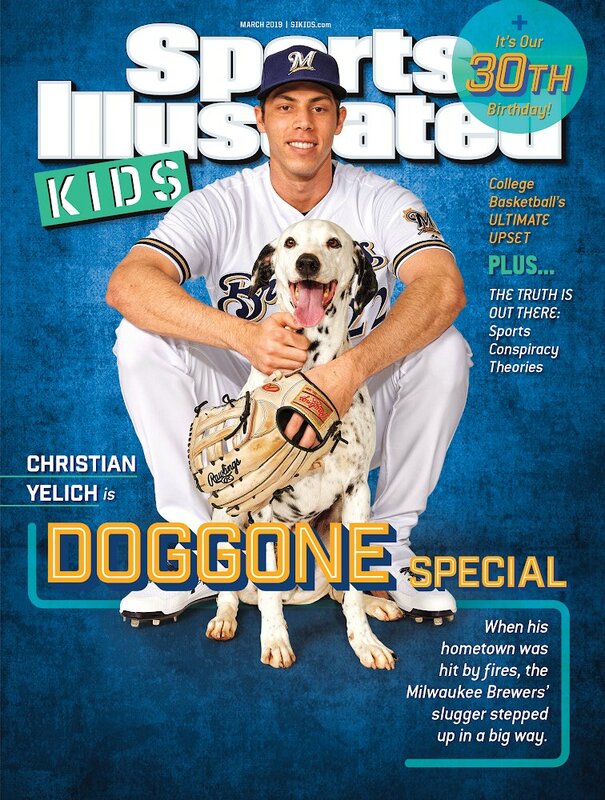 The team will once again be led by MVP outfielder (and my personal man crush) Christian Yelich, who single-handedly propelled the Brewers to a division title with a monster second half. How good was Yelich’s second half? I’m glad you asked. In 256 at-bats, he posted a triple-slash of .367/.449/.770 to go with 25 home runs, 67 RBIs, and 10 stolen bases. You read that right. Not only did Yelich average a home run for every 10 at-bats in the second half, the 25 home runs were higher than any of his previous single-season totals. He fell just short of becoming the 13th Triple Crown winner since 1920, falling just two homers and an RBI behind the leaders. And he did all of this at the ripe age of 26. He is just entering his prime, and he should be one of the most entertaining players to watch in Major League Baseball next season. Beyond Yelich, the Brewers boast one of the deepest lineups in all of baseball. Lorenzo Cain was one of the most dynamic leadoff hitters in the league last season and will anchor the center field position for the Brewers again. Ryan Braun returns to round out the outfield, and while his 2018 numbers don’t pop out at you, he finished hot to the end the season and will provide a stabilizing veteran presence. Jesus Aguilar broke out in a big way in 2018, clubbing 35 home runs in 492 at-bats and will give opposing pitchers fits in the middle of the lineup. He will be joined in the infield by Travis Shaw and Mike Moustakas, two of the league’s more underappreciated players. They both played integral roles in the team’s playoff run last season, and are forces to be reckoned with in the middle of the Brewers lineup. The previously mentioned Yasmani Grandal will slot in at catcher, while Orlando Arcia returns at shortstop. After struggling to the tune of a 54 wRC+ during the regular season, Arcia turned it up in the postseason, slugging three home runs in 33 at-bats. The Brewers certainly hope he can build upon that performance and establish himself as an above-average shortstop in 2019. While the Brewers boast an elite offense, their bullpen might be even better. Josh Hader is arguably the best left-handed reliever in baseball, posting a whopping 15.82 K/9 ratio in 2018 to go with a strong 2.43 ERA. His teammate Jeremy Jeffress was just as effective in 2018, posting a minuscule 1.29 ERA while taking over the closer role in the middle of the season. Fellow reliever Corey Knebel rebounded from a rough mid-season stretch by throwing 16 1/3 scoreless innings in September. If these three relievers are on their A-game in 2019, the Brewers could easily lead the league in bullpen ERA. Behind their top three bullpen arms, the Brewers also possess many quality options, including Taylor Williams, Jacob Barnes, and Junior Guerra. The deep bullpen should help overcome their shortcomings in the rotation. Jhoulys Chacin returns to front the Brewers. His 3.50 ERA, 4.03 FIP, and 116 ERA+ are not elite numbers, but Chacin should provide a stabilizing presence for the rotation and give the team a chance to win every time he takes the mound. Chase Anderson took a step back last season, as his ERA was nearly a run higher than his breakout 2017 season (2.74 to 3.93). Perhaps more alarming, his FIP was a mediocre 5.22 and his strikeout rate dropped in 2018. Anderson has continuously outperformed his FIP, so perhaps he can do so again in 2019; however, it is definitely something for the Brewers to keep an eye on. Zach Davies has exhibited the potential to become a reliable mid-rotation arm in 2016 and 2017, posting sub-4 ERAs in both seasons. However, he struggled badly in 2018, posting a 4.77 ERA in 13 starts and never regained form after suffering a shoulder injury. A bounce-back season would go a long way for the Brewers in 2019. Jimmy Nelson is projected to return to the rotation after missing the entire 2018 season. He broke out in a big way in 2017, posting a solid 3.49 ERA and 3.05 FIP. If he can effectively shake off the rust after such a long layoff, he could easily emerge as the Brewers best starter in 2019. Brandon Woodruff and Corbin Burnes both received the opportunity for their first extended major league run in 2018, posting solid seasons, primarily out of the bullpen. Both came up as starters through the minor leagues, and both should be given a chance to see if they can be effective major league starters. Overall, while the Brewers lack a true world beater and have many questions throughout their rotation, they possess a number of intriguing talents that should make them a formidable unit in 2019. A lot of my fellow writers in M-SABR will disagree with this prediction. The Brewers might not have had the flashy offseason that the Cardinals or Reds had, and they certainly don’t boast an expensive, big-name rotation like the Cubs. However, let’s not forget they won the division, had the most wins in the entire National League, and came very close to a World Series berth last season. The Brewers have a lot of talent offensively and on their pitching staff, and there is no reason to believe they cannot win the division again in 2019. I already devoted an entire paragraph to Christian Yelich, so I am going to turn my attention to an underrated cog in the Brewers lineup, Travis Shaw. Shaw followed up a breakout 2017 season with a fantastic effort in 2018, posting a .241/.345/.480 triple slash to go with 32 HRs and a 119 wRC+. He impressively maintained his strong performance while transitioning to second base after the Brewers acquired Moustakas at the trade deadline. Shaw will move back to third base for the 2019 season, and with on-base machines Yelich and Cain batting ahead of him in the lineup, he is in a prime position to drive in 100+ runs in 2019. 2018 was a rough year for Jimmy Nelson. Following a breakout 2017 season, it appeared that he would anchor the Brewers rotation in 2018. Unfortunately, elbow surgery derailed his season before he could even get started. After a rough Spring Training debut, he threw three solid innings in his second appearance against the White Sox. While Nelson still has a lot of work to do to recapture his 2017 form, the early returns are promising for a Brewers team that is in desperate need of an ace. The Brewers have traded many prospects over the past year to improve their major league team. Through all of the trades, they have held onto Keston Hiura, and for good reason. Hiura is one of the best pure hitters in the minor leagues, hitting for a high average while racking up 13 home runs and 15 stolen bases in 123 games between High-A and Double-A. Hiura is projected to begin 2019 in Triple-A, but it should not be too long before he is knocking down the door for the Major Leagues. While the Brewers appear to have second base locked down with Mike Moustakas, Hiura could easily force a mid-season promotion if he continues to progress with his bat.